On Monday, October 9th, Eric L. Harrison presented at the Annual Tort Law Conference hosted by the New Jersey Institute for Continuing Legal Education, held at the New Jersey Law Center located in New Brunswick. Eric provided an update on recent developments in public entity law. 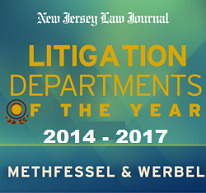 On October 17th, Matthew Werbel and Stephen R. Katzman will present at the Annual New Jersey Special Investigators Association Convention at Harrah’s Resort in Atlantic City. Their presentation will discuss keys for successful SIU testimony and potential pitfalls during an investigation. Richard Nelke will also present at the Annual NJSIA Convention in Atlantic City. Rich will hold a discussion on the various types of claims that are grouped as “Mysterious Disappearances.” He will also review case law concerning recorded statements and their effect on Examinations Under Oath. Friends and clients interested in attending the future seminars are welcome to contact Matt Werbel, Stephen Katzman, or Richard Nelke directly.